It is no secret that evolutionary teaching and the religion of naturalism run rampant in public education. The idea that life has been evolving on earth for millions of years is taught as fact from the earliest ages. Kindergarteners are taught that dinosaurs never lived with man, and high school biology courses teach that we evolved from single-celled organisms. What is the solution for parents who strongly disagree? For many, the plan is to homeschool their kids from kindergarten through senior high and then send them to a Christian college. Christian parents have good intentions. Unfortunately, the reality is that Christian curricula and colleges that teach a literal 6-day creation around 6,000 years ago are the exception, not the norm. The ministry of Answers in Genesis, where I serve, has looked closely at curricula and contacted hundreds of schools. AiG found that many homeschool curricula and most Christian colleges promote evolution and hold to various old-earth views. Parents need to know what’s going on and be better equipped to make decisions that will further the educational goals for their children. Like many other Christian parents, my wife and I decided that homeschooling was the best option for our children. Both of us grew up attending public school but have recognized the increasing secularization of public education. At home, my wife would know what my daughter was learning. And together we could ensure that the classroom—not just our home and church—was bringing her up to trust the history in the Bible. In my wife’s first week teaching, one of the books referenced sharks predating dinosaurs by millions of years. Another book promoted the idea that the moon broke off from the earth when it was forming millions of years ago. As we looked ahead at other lessons, we recognized the amount of research that would be necessary for us to find a solid curriculum and supplemental reading that gives a biblical perspective on evolution. Even when a curriculum is designed for homeschoolers, that does not necessarily mean it is a Christian curriculum or that it teaches biblical creation and a solid Christian worldview. Further, we realized that some of the supposedly Christian homeschool companies that we found were simply imprints for a large secular mega-publisher trying to make a buck off another market. At AiG, I help connect our supporters to good Christian colleges. I recently received an email from a conservative Christian university wanting to display and promote their school at AiG’s annual college expo. 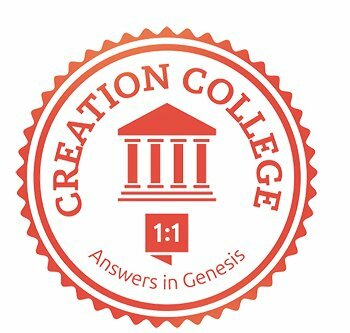 After sending them a list of basic beliefs regarding creation, the flood, and the age of the earth that they needed to affirm to attend the expo, I received an email asking if the school needed to actually believe and teach these tenets or if they just needed to understand that the statements are Answers in Genesis’ beliefs. It quickly became clear that their doctrine was compromised regarding Genesis and that they wouldn’t be able, in good conscience, to agree with these tenets of creation. Students need help to see that God’s Word is the foundation for understanding everything in our world. The same issues that impact homeschool curricula also trouble Christian colleges, universities, and seminaries. Back in 2011, Ken Ham explored this unseen compromise in his book Already Compromised, featuring a national study, conducted by America’s Research Group, of the beliefs among school leaders. The research showed that college presidents are often unaware of what the Bible and science departments are teaching about origins. Even on the same campus, surveys found that the Bible department may teach evolution while the science department teaches creation. As part of my duties to help spread the biblical message of creation and help parents and schools work together toward this end, I am grieved to see firsthand how few schools take a strong stand on Genesis and on biblical authority. It’s a labor-intensive process, but thankfully the ministry has decided to help parents by showcasing the curricula and schools that are doing things right (see below). So where does a parent start to find publishers and schools that take a strong stand on Genesis? As a free service to all Christian families, Answers in Genesis has created two websites to help moms and dads in their search for homeschool curricula and colleges that believe and teach the biblical worldview. Our new CreationPublishers.org and CreationColleges.org sites are a clearinghouse of homeschool publishers and schools, respectively, that have affirmed the most important tenets of creation. I. We affirm that the scientific aspects of creation are important, but are secondary in importance to the proclamation of the gospel of Jesus Christ as Sovereign, Creator, Redeemer, and Judge. We deny that the doctrines of Creator and creation can ultimately be divorced from the gospel of Jesus Christ, for the teachings of Genesis are foundational to the gospel and indeed to all biblical doctrines (directly or indirectly). V. We affirm that the account of origins presented in Genesis is a simple but factual presentation of actual events and therefore provides a reliable framework for scientific research into the question of the origin and history of life, mankind, the earth, and the universe. We deny that Genesis 1–11 is myth, saga, or any other type of nonhistorical literature. We also deny that it is a parable or prophetic vision. It therefore should be interpreted with the same care for literal accuracy as other historical narrative sections of Scripture. The CreationPublishers.org site features companies like Abeka, BJU Press, Master Books, Science Shepherd, the 101 Series (Westfield Studios), and Answers in Genesis materials. Schools like Appalachian Bible College, Bob Jones University, Bryan College, Calvary University, Clarks Summit University, Maranatha Baptist University, and Patrick Henry College are among the 60+ schools on CreationColleges.org. We are constantly checking these institutions and others to ensure that both lists are as accurate and up-to-date as possible. In the Gospel of John, we read that Jesus prayed for his disciples, “ Sanctify them in the truth; your word is truth ” (17:17). Scripture is God’s perfect, inerrant Word, and his Word is truth. Throughout their schooling, children will learn math, science, history, language, health, life skills, arts, and physical fitness, but how closely is the Bible tied to them? If students are involved in Christian schooling or homeschooling, Bible courses will also be included in their studies. But they need help to see that God’s Word is the foundation for understanding everything in our world. If kids get Bible teaching in just one class (or only in church), they are tempted to believe secular authorities in other areas like science, math, and history, even if what those subjects say conflicts with God’s Word. This goes against God’s instruction to integrate the Bible into every aspect of our lives. God clearly explains in Deuteronomy, “ These words that I command you today shall be on your heart. You shall teach them diligently to your children, and shall talk of them when you sit in your house, and when you walk by the way, and when you lie down, and when you rise ” (Deuteronomy 6:6–7). If we are not teaching our children and grandchildren God’s words, we are teaching them man’s words. Teaching ideas contrary to the Bible is teaching kids to distrust the Bible. We are either for Christ or against him. There is no neutral ground. Not everyone will teach their children formal classes or choose to send them to a Christian school. But all parents have the duty and privilege to diligently bring up their kids in the knowledge of the Lord, including by providing a strong foundation for defending the Christian faith and proclaiming the gospel. If parents choose public school as the best option, AiG’s free new publishers’ site gives good ideas for resources to help counter what kids are being taught and to equip them to stand for the Lord. Tim Lutz is product distribution specialist with Answers in Genesis. He also serves as content and marketing coordinator for the CreationColleges.org and CreationPublishers.org websites. Tim graduated with a degree in education from Miami University.